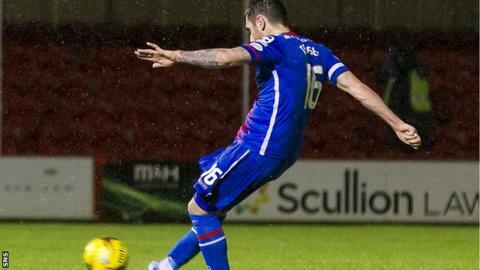 John Hughes lamented his Inverness side's stuttering second-half performance as they let a two-goal lead slip before rallying to beat Hamilton. Caley Thistle lost two late goals to draw 2-2 with Aberdeen on Saturday. "Once again this season, for some unknown reason, we only play for 45 minutes," Hughes told BBC Scotland after the 4-3 win at New Douglas Park. "We sit too deep, it brings it on top of us, we think we can see it out. That's a recipe for disaster." The manager would not be overly critical of his players, however, as Liam Polworth's fine strike with the final kick of the game rescued victory in South Lanarkshire. "It shouldn't be like that, we should be seeing the game out," said Hughes. "But I'm going to be too despondent. "It's a difficult venue to come and play on the plastic pitch. I'm absolutely delighted to pick up the result." Hughes also praised the "spirit" and resilience of his squad after three Caley Thistle players were seen to quarrel over Christian Nade's late equaliser that tied the game at 3-3. "That was absolutely magnificent," said Hughes. "You know why? It tells me they care. You've got players in that dressing room that care. "We're going in the right direction. That's the kind of spirit we've got. We hate to lose a goal." Hamilton Academical counterpart Martin Canning, meanwhile, said Polworth's winner left him suffering "one of the lowest feelings" he had experienced, either as a player or a manager. The defeat leaves Accies without a win since late November. "I think at 2-0 down you can see we were needing a wee spark, a lift, and we get the goal back," said Canning. "I think from there, the boys come back to having that little bit of belief. "It's so disappointing to have lost it the way we lost it with the last kick of the ball. Obviously it's a fantastic strike if you're Inverness, but for us, it just sums things up at the minute. "When things are going against you, that's the kind of thing that happens."